Software such as RoboForm and LastPass simplify password management by storing many passwords in an encrypted “vault” and filling them in automatically when they are requested on websites. They all will generate long, complex passwords on demand. You just have to remember one master password to unlock the vault and set a reminder to change passwords monthly. Password managers have evolved additional features such as auto-filling forms, backing up data and passwords to the cloud, syncing passwords across devices, adding support for two-factor authentication, importing bookmarks and competitors’ password file formats, and so on. 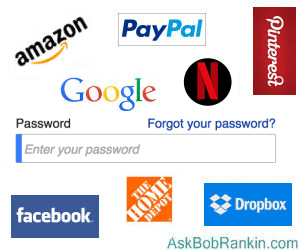 Like other security software, password managers are locked in an ever-escalating features war. Into this fray jumped Dashlane. It does all of the above, including two-factor authentication in version 2.0. If you enable two-factor authentication, Dashlane will text to your phone a code that you must enter manually before your master password will unlock Dashlane’s vault. It also does a great job of minimizing keystrokes, the second most important function of a password manager. For example, when you want to log in to Facebook you don’t have to choose a profile from a drop-down list, as you do in some other programs. Dashlane recognizes the Facebook log-in screen, fills in your username and password, and even “clicks” the log-in button for you. The log-in screen flashes by so fast you may miss it if you blink. Dashlane version 2.0 introduces a “security dashboard” where you can review all of your passwords. It highlights weak and outdated passwords, nudging you to strengthen your defenses. But the more interesting news in the latest version is the Password Changer, which lets you update your passwords with a single click. You select the sites on which you want to change your passwords (about 75 popular sites, including Facebook, Twitter, Google, Amazon and Dropbox are supported). Dashlane will generate new passwords, then automatically login and change your passwords on the selected sites in just seconds. This is pretty awesome in light of the fact that security breaches like HeartBleed and ShellShock are occurring at an alarming pace, and the best course of action when these things happen is to change all your passwords. Doing it manually is a huge nuisance. Clicking a button to make it happen is (almost) fun. Lastpass, a Dashlane competitor, introduced a password changer feature just a day after Dashlane announced theirs. It supports the Chrome, Safari, and Firefox browsers, but not Internet Explorer. It also lacks the automation offered by the Dashlane password changer. You'll need to select a site, do the password change, select the next site, and so on. But still, it's a time saver over logging into each site and navigating to the password change page. I'll admit that not having this feature in Roboform has made me dread the task of updating some of my own passwords on a regular basis. On the downside, cross-platform syncing with Dashlane now costs $39.99 a year. That means passwords and form data that are stored on your PC are not available on your phone unless you pay. Earlier free versions feature syncing; users are urged to donate voluntarily. Dashlane also acts as a digital wallet, storing your credit card and even Paypal data securely and filling in their details wherever needed. If you have multiple versions of a profile (e. g., different shipping addresses you’ve used on Newegg.com), Dashlane stores them all and lets you pick one from a drop-down menu. Dashlane cannot work in the iOS Safari browser thanks to Apple’s developer rules; neither can any other password manager. Dashlane gets around this with its own mini-browser, which you must open whenever you want to supply a password on an iPhone or iPad. Aside from the premium syncing fee, Dashlane is a fine option for a password manager and digital wallet. I've been using the paid version of Roboform for years, so I'll be considering a change when my next renewal comes due. Most recent comments on "Dashlane's Free Automatic Password Changer"
I just checked Dashlane's site and it now costs $39.95 a year, but I think I will give it a try. This is a good article and I'm probably not the only one that needed reminding about password security. I believe the important area to protect is my online banking and this is where my alphanumeric passwords are more complex. I have a different password for each requirement and, because of the method I use, have no difficulty in making changes. Consequently I'm averse to paying for the service and also detect a complexity which I don't want to mess with. 1. All of my keys are now under the control of the Dashlane program. If anything were to happen to it, my keys would be unavailable until the problem was fixed (if it could be fixed). I feel better knowing my actual keys (even if that means they can't be as long and random) than only knowing the key to a vault. 2. Everything is now dependent on my remembering (or recording) the key to the vault. That makes it a single-point failure. 3. What happens if I am incapacitated or die? I still need to make sure that trusted family members or friends can get access to my vault. In fairness, the above objections are generalized ones for all password protection. I already use my own private vault (an encrypted file which stores my various passwords and other crucial financial data) which I can consult when my memory fails me. And family members know where and how to access it if necessary. The problem with all locks is that you want them to be perfectly secure against intruders, but not so perfectly secure that you (or an heir) couldn't pick your own lock if you had to. That tension will always exist. As far as the strength of a password is concerned, I'm attracted to the Haystack Theory (grc.com/haystack.htm) of using simple, easy to remember passwords with lots of padding. Sounds like a great tool. Would the free version give an indication of how good the paid version is? I'm temporarily unemployed. Is there a program that would store your master password for that program and change it every 30 days according to the security advice automatically? Also if that program is so safe and is virtually impossible to break, what happens if you just forget your current master password for all your stored and automatically generated passwords? I bet there is a reason for old proverb to not keeping all eggs in one basket. So do the math and predict your future with this program. I have been a faithful Dashlane user for quite some time now, and I have been amazed at its simplicity. The user interface is very intuitive, and I am convinced that it is every bit as safe to use and secure as it claims to be. I have not had any issues at all with any bugs or with anything that has adversely affected the computer. I also have a Windows Phone, and from a Dashlane standpoint, that's one thing where one can say "there ISN'T an app for that." Therefore I opted not to pay for basically only a synch'ing feature. I am also impressed with the new password changer (actually just with its existence since I've yet to use it). I am anxious to put it through its paces and see it do what it's supposed to do, especially given that the Security Dashboard has been yelling at me daily (not really) for having weak and/or overused passwords. Wish I could trust a password company to keep my information a secret. But I do not. EDITOR'S NOTE: Good news! You don't have to trust them. You have the option to store all the data on your local computer, or in encrypted form on their server. In the latter case, only you would have the encryption key. I don't always understand everything I know about computers. If I set up Dashlane and they have a power outage or terrorist attach, does this mean I wouldn't be able to open up any of my online accounts, unless I have a printed copy of all the passwords stashed somewhere? EDITOR'S NOTE: No, you'd have a local (encrypted) copy of the passwords. I certainly think this is a very important security tool but the double the price to 40$ per year is too much. What does your volunteer donation refer to? Other good tools are available at no or at least a reasonable cost. Hi Bob. I just wanted to mention KeePass as well. It is a free password manager that I've been using since the Heartbleed epidemic and I'm very happy with it. It also recognizes the website and automatically logs in with one keystroke, which I really like. It doesn't have the change password feature you've mentioned in this article. I'd like that feature, but the passwords I'm most worried about are for financial websites (banks, credit cards, etc.) and none of those are included on the list of 75 that Dashboard works with. I don't use two factor authentication with it but apparently there is a plug-in you can get to provide that functionality. Thanks Bob, for this valuable information. I'll check this site out. However, I do have a question. Do you know of any other free sites that do the same thing? I have also been using RoboForm for many years and like it very much; however, I have noticed lately more sites are not accepting sign-ins directly from RoboForm I am having to manually enter name and password on more and more sites. Dashlane sounds like a good program, but not at $40 a year when LastPass can be had for $12. I too have been using RoboForm for several years. I mostly use LP and probably will drop RF to keep my life simple. LP also has 2-Factor Authentication and can also be used with a Yubikey which is really nice. EDITOR'S NOTE: ...and there's a breach that reveals your password to Evil Hackers... then YES, you need to change it. Didn't you once explain how you don't NEED to change passwords frequently? - if you have a good one to begin with ..
i am thinking what happens if somebody steel may master password, change and let me out. that happen to me few days ago. a hacker change all my passwords and let me out. I try to contact google, but they don't have costumer service to help you. so i lost all my contacts, my email, everything. terrible. What if one has several different email accounts with one company (eg. several gmail accounts). Does Dashlane differentiate between them? I've had problems with a different password generator on this topic. EDITOR'S NOTE: I would certainly hope so -- they have unique usernames. If not, it would be a flaw in the software. RESPONSE: If the program can change passwords on 3rd party websites, it can "phone home" that same information. So I have to trust that it does not. Hence my original comment. Wow, talk about coming to the conversation late! So, I read this article a month or so ago and decided to try Dashlane. I'm using v. 5.0.0 and went ahead and purchased the premium version. I'm still trying to decide if I like using it. One big problem I'm having with it is that it is not able to distinguish between a log in page and other data entry boxes sometimes entering passwords or overwriting passwords with non password data. I've been locked out of some websites because of Dashlane auto login function but using a wrong password. I also find multiple password files for a single website with differing passwords. I tried the auto password change function and found that all it did was send me to the website and left it up to me to go through the change password function. But I see now that that function is only available on a limited number of sites.